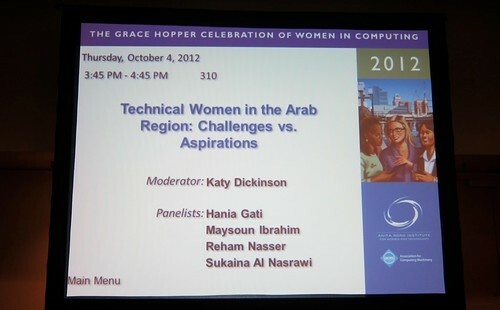 Our Grace Hopper Celebration of Women in Computing panel called “Technical Women in the Arab Region: Challenges vs. Aspirations” was well attended and successful. The audience wanted to ask questions and talk far beyond the limits of the time available. My daughter Jessica took pictures for us. It took months of preparation to make this happen – not only the preparation of the conference submission but applying for and getting four travel scholarships and visas for travel from the Middle East and North Africa. 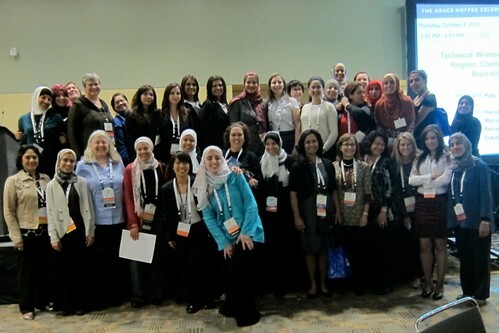 Many of the 2012 TechWomen mentors and mentees attended to see the only presentation from the first TechWomen class. I think they loved it. Everyone wanted to be in the picture at the end. 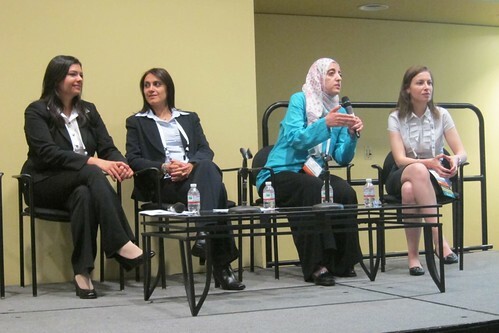 10/22/2012: Read Larissa’s Review of this panel. the future of computing is in lovely hands !!! !